Celebrate Labor Day Weekend by participating in the culmination of the grain growing season in Minnesota at Oliver Kelley Farm. 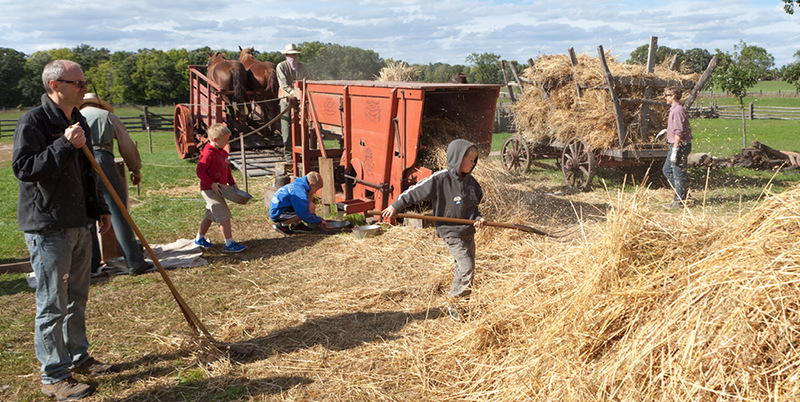 On the historic farmstead, help the farmers haul grain bundles from the barn and field, thresh grain in an 1856 Cox and Roberts horse-powered threshing machine, or try your hand at flailing grain. Help bag up the grain, then enjoy a rest on the porch with a glass of lemonade or explore how wheat and flour are used in the historic house kitchen. Then head to the Farm Lab to discover how grain is harvested and processed today. In the Learning Kitchen, experiment with different types of grains and flours and sample some baked goods made with different grains.